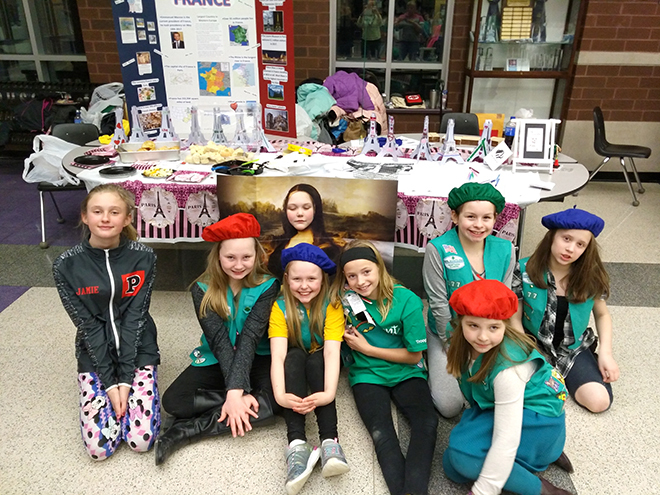 Members of Troop 877 wore berets as they learned about France at World Thinking Day 2019. The Girl Scouts of the WinDuPec Service Unit celebrated World Thinking Day on Feb. 26. World Thinking Day originated in 1926 and is celebrated around the world with Girl Scouts and Girl Guides. Every year, scouts join together and take part in activities that promote changing the world for the better and learning about scouts from around the world. This year’s theme was leadership. The girls that participated explored different ways to be leaders, create the change they want to see in the world, and celebrated being a part of the global sisterhood that is Girl Scouts and Girl Guides. Area troops set up country displays at the World Thinking Day event held at Pecatonica High School. The girls taught other scouts about their country and shared foods and games. The scouts were able to learn about more than fifteen different countries. They also learned about the history and future of Girl Scouts and how they can make a positive difference now.